Hey everyone! This is Mindy & Brandon Taylor, people who you will definately recognize from the wedding website (because they’re so gorgeous and all over it!!). 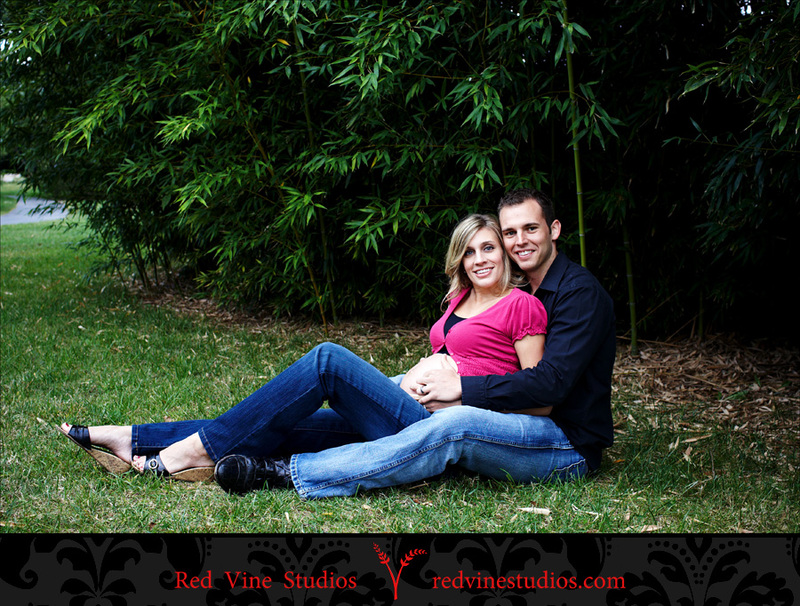 We communicated about celebrating the upcoming birth of their first child with a Red Vine Studios – +1 session. That’s what I call my maternity sessions btw… +1 or +2 if you’re having twins… hehehee. So we met up on Monday at the Japanese Stroll Gardens here in Springfield, MO and just absolutely had a blast taking some nice portraits of them together and a ton of just Mindy basking in her motherly glow! So without further adieu or Mediacom Cable service interruption (don’t ask! No Internet for 3 + days! yikes…) I am blessed to present a gorgeous preview of The Taylor’s + 1 Maternity session to you below. Enjoy! We started by this gorgeous wall of Bamboo at the Garden! 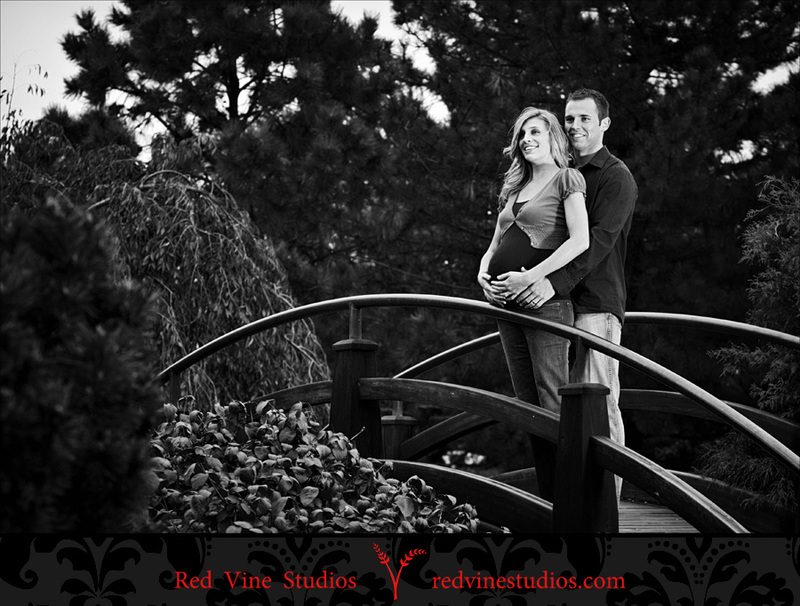 It wouldn’t be a Red Vine Studios photo shoot without some smooching going on! Mindy is just stunning in this candid photo as my Asst for the day LeAnn made her laugh. camera or by professional photoshop for art’s sake. More tilt shift baby bump loving! Mindy is SO gorgeous, all in her motherly glow. Hard to believe that she’ll be a full time mom in less than 6 weeks time! Here’s the same shot essentially, but with a special Black and White process that I’ve been working on for outdoor portraits. I LOVE IT!!! Now this shot was processed with a slight vintage aging process in Photoshop, not truly a Sepia tone, I just call it “Aged to Perfection”. and edits in every session that I shoot. It doesn’t matter if it’s families, +1 Maternity sessions, Seniors, or Weddings. Variety is the spice of life! A little more tilt shift love for you all, I try not to do too many of these edits, but it’s hard not to. Certain shots like this one, BEG for it! And then we escaped from the lovely bamboo wall, into the open air bridge at the gardens and were assaulted by the wind. Not as much fun, but the bridge photographs so nicely… even in gale force winds. Looking out into the future… a little Titanic feel to this one. Once again, the special Black & White process lends a hand. Brandon (#1 Dad to be!) wanted to kiss the baby… so I said go for it, pucker up! Love this shot SO much. It’s simply lovely. That’s when I bust out my full lighting kit and rock it out with some good light and some hard edges and contrast to the images. Take a look below! Sitting in the window of a Japanese building, Mindy looks so cute in her lil dress. I seriously can’t believe that she’s only 6 weeks away from delivering! And literally the last photo of the night, and then we ran to the exit before the gardens and the park locked up on us. I simply adore how Mindy’s just got the cutest lil baby bump ever. Mindy you rock! You and Brandon are going to be awesome parents! So once again, to all the friends and family and complete total strangers visiting the blog today… lol, Thank you for taking the time to stop by and look today. If you feel the need to heap tons of lovely words and praise upon this gorgeous family, please comment below. There is no obligation or spam emails involved, just honest REAL comments for awesome REAL people! Chris - love the tilt-shift shot! awesome!! !